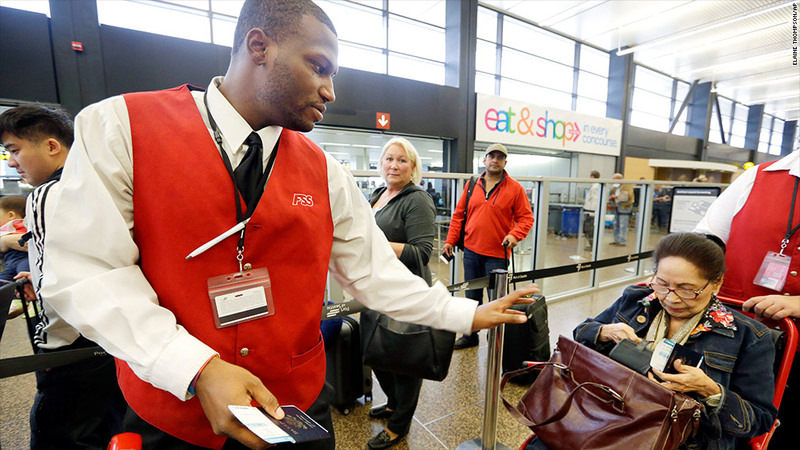 Airport workers in SeaTac, Wash., are poised to have their minimum wage raised to $15 an hour. It's a good day for low-wage workers in New Jersey and the city of SeaTac, Wash., after residents on Tuesday favored ballot measures that will raise the minimum wage. With all precincts counted, the 'Yes' vote was leading by 54% to 46%, but opponents say it is still too close to call. There are still uncounted votes, due to Washington's mail-in voting system. SeaTac Proposition 1 also calls for paid sick leave and tip protection. Proponents of the measure say it will boost the local economy and drive consumer spending by putting money in the pockets of low-wage workers. Those on the other side argue that such a dramatic hike will burden small businesses and end up costing the city of SeaTac money to enforce it. David Rolf, president of a local Service Employees International Union, said that voters were sick of waiting for companies and Congress to take action against stagnant wages. "People have been waiting a really long time for this," he said. "For the first time in many years, the people who put fuel in jets might just be able to buy a ticket on one." While not quite as dramatic of an increase, New Jersey residents voted to raise the state's minimum wage by $1 to $8.25, The ballot initiative also put an automatic annual cost of living increase for the minimum wage in place. Both the New Jersey and SeaTac measures would take effect Jan. 1. These wage hikes come a little more than a month after California lawmakers voted to raise the state's minimum wage to $10 an hour from $8. Earlier this year, New York and Connecticut approved measures that would increase minimum wages to $9 over the next few years. Organizers in a number of other states, including South Dakota, Massachusetts and Idaho, are gathering signatures to place similar measures on ballots in November 2014. States must pay at least the same as the federal minimum wage, which has been set at $7.25 an hour since 2009. But as of January, New Jersey will join 19 other states and Washington, D.C., in having minimum wages that exceed the federal level. The fight for a living wage has played out beyond the election booth and onto picket lines across the country. Over the last year, workers from Wal-Mart (WMT) and fast food chains have walked off work and protested for higher wages, better hours and benefits, and the right to form an union without retaliation. Those in favor of minimum wage raises such as those in SeaTac or New Jersey say that the new measures will generate economic growth. "When you increase the purchasing power of the lowest paid workers in a state, you drive consumer spending and that can promote job growth and end up supporting small businesses," said Jack Temple, a policy analyst at the National Employment Law Project, an advocacy group that focuses on low-wage workers. But those on the other side say that small businesses can't afford the higher wages, and people will end up having a harder time finding jobs. Common Sense SeaTac, a group opposed to the SeaTac ballot measure, says that small businesses will suffer and young people just starting out will find it harder to get their foot in the door. "These private-sector issues should be negotiated between employers and employees, not imposed by our small city," the group said in a statement.